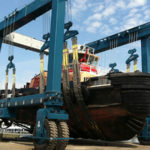 Hydraulic Boat Hoist Manufacturer Also Provides Electric Boat Hoist! 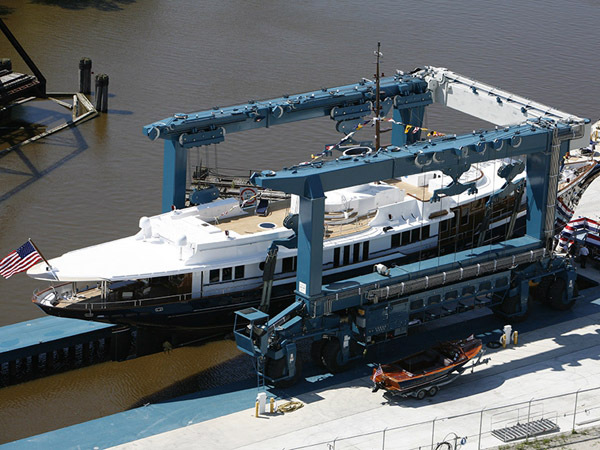 They Both Have Two Types Marine Travel Lift Construction Travel Lift! 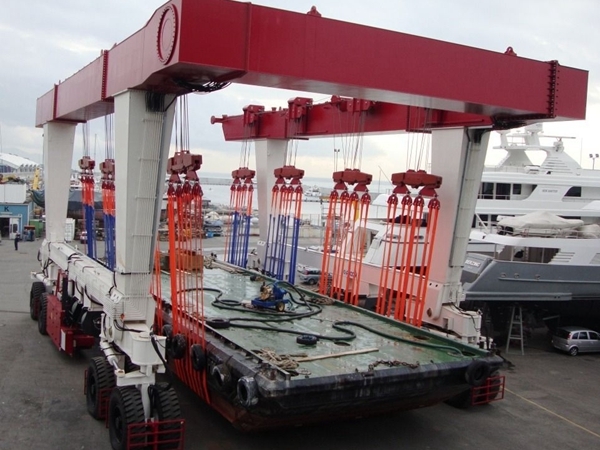 Hydraulic boat hoist is kind of large gantry crane. It has powerful loading capacity! It can load and unload large vessels stably and easily. 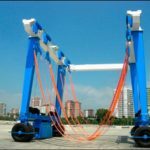 With complete safety protection devices, hydraulic boat hoist can reduce failure rate, protect operator from accident and damage. High safety devices can prolong service life. Customers can choose hydraulic marine winches for different occasions, such as for water sport meetings, aquatic clubs, voyages, seaport, yacht and construction site. 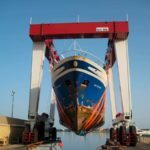 Ellsen Group, a professional marine travel lift manufacturer in China, provides types of reliable boat hoists for sale, such as port used small travel lift boat crane, dock travel lift, factory direct sales marine travel lift, ISO approval marine travel lift, safe driving steady vessel hoist. Customers can choose suitable type according to practical needs and requirement! Choose Ellsen for professional technology, great after-sale service and factory price! 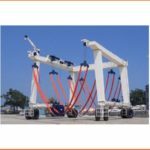 Why choose hydraulic boat hoist? For application, hydraulic marine winch can be applied for many occasions. It is mainly used for boats handling, water sport meetings, aquatic clubs, voyages. It has its own diesel generators to provide power. The whole car is equipped with hydraulic drive. Distance of lifting points are adjustable. 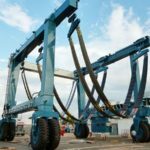 Multiple lifting points can work together when the machine is lifting vessel. Tire traveling structure is simple, it has the function of oblique motion, Ackerman steering and rotary 360 degree place. It has a climbing function of full load of 4%. 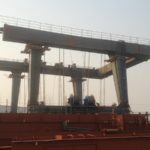 The connection between main beam and end beam is articulated form, it can remove the partial stress due to traveling on the severe condition road. Hydraulic type travel lift makes it easier and safer to lift boat from water, put boat into water or maintain boat on the land. It help save much energy and time! 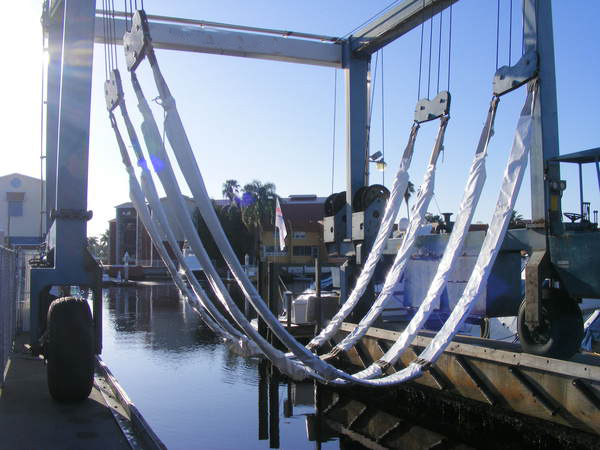 Sling is an important part of marine boat lift. How to protect the sling and ensure long service term? The answer is sling shield or sling covering. 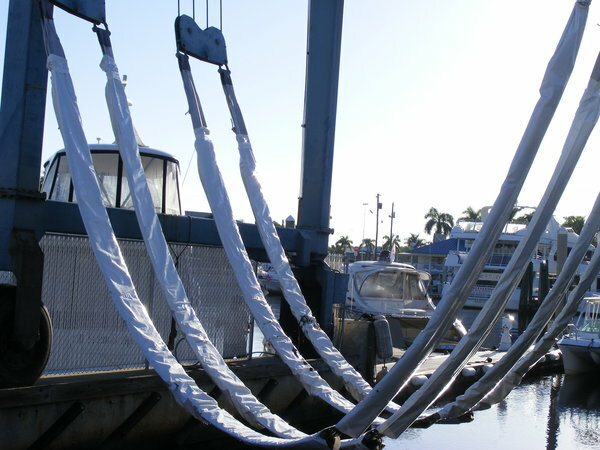 It is mainly designed to protect the slings and the boats, and keep dirt and paint off slings and boat hulls. It has simple installation, only one man can install the sling easily in 16 and 18 inch. The sling comes in 300 ft and 600 ft rolls. 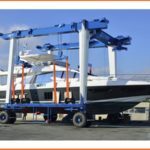 Ellsen travel lift manufacturer offers best price, for any question about mobile boat lift, just contact us for quotes and freight costs. Boat hoist is non-standard customized equipment with self-power, multiple point lifting, full hydraulic transmission, the upper structure is double door frame “U” type connection frame to meet different ship types (such as sailing) lifting operation demand. It is mainly used for boat’s water launching, plant lifting, and it can conveniently and quickly lift, maintain and repair of different boat or the transport work in the plant with very strong safety and reliability.